The Kane County (Illinois) Planning Cooperative was established to implement the Kane County 2040 comprehensive plan, which integrates transportation, health, and land use goals and objectives. The cooperative also works to engage elected and appointed officials, planning commission members, staff, and private sector representatives. Strategies include advancing leadership, conducting a food hub feasibility study, and implementing the Fit Kids plan. The cooperative's Plan4Health team supported phase two of a food hub feasibility study to identify ways to improving access to fresh foods. The coalition worked closely with farmers, buyers, and community members to identify and vet possible models and sites for the food hub as well as to provide Good Agriculture Practice (GAP) training resources. Phase two of the study intentionally incorporated a lens of health equity, ensuring that potential strategies identified for implementation also supported vulnerable communities and advanced access to healthy food for all residents. 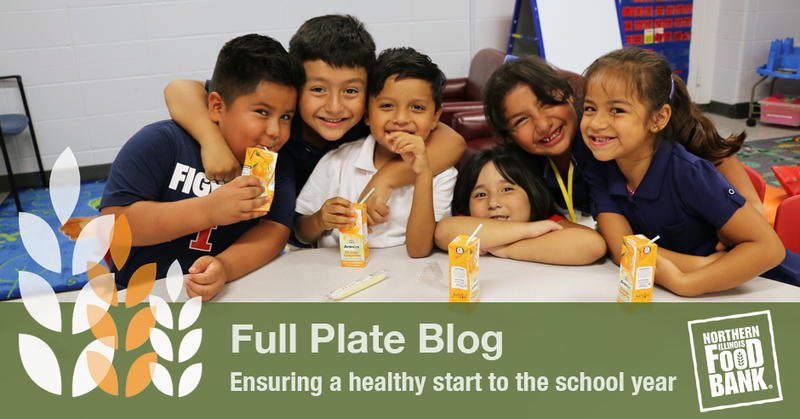 Students from Elgin, Illinois, on a food bank blog. Photo courtesy Northern Illinois Food Bank. Data from the 2011–2012 Kane County Community Health Assessment shows that Kane County has high rates of overweight and obese residents, with an average obesity rate of nearly 30 percent across the county. One in five children in the county is overweight, and in some communities it is an alarming one in three. Only 14 percent of adults report eating five servings of fruit and vegetables a day. Additionally, federally qualified health centers serving low-income patient populations report health outcomes data that differ significantly from county-level outcomes data, reflecting underlying health disparities of vulnerable populations in Kane County. "This Food Hub Feasibility Study will allow Northern Illinois Food Bank to more acutely assess and ascertain its role in the local food system, with a primary goal of determining the best means to access the available products to benefit the agencies and people we serve." A complementary strategy for the coalition was a mobile food demonstration program. The coalition leveraged the reach of existing farmers markets by setting up a booth at three different farmers’ markets across Aurora, Illinois, in 2015, bringing information about the program to approximately 80,000 residents. Leaders from the Plan4Health project in Kane County also participated as task force members in the Illinois Chapter's Planners4Health project. The final iteration of Plan4Health, Planners4Health was a six-month initiative to strengthen the connection between planning and public health at the chapter level. Success story was developed in partnership with the Kane County Planning Cooperative. Top image: Farmers' market in Kane County, Illinois. Photo courtesy Kane County Planning Cooperative.